For the county in the Commonwealth of Massachusetts, see Suffolk County, Massachusetts. Suffolk County /ˈsʌfək/ is a predominantly suburban county on Long Island and the easternmost county in the U.S. state of New York. As of the 2010 census, the county's population was 1,493,350, estimated to have decreased slightly to 1,492,953 in 2017, making it the fourth-most populous county in New York. Its county seat is Riverhead, though most county offices are in Hauppauge. The county was named after the county of Suffolk in England, from where its earliest European settlers came. Suffolk County incorporates the easternmost extreme of the New York City metropolitan area. The largest of Long Island's four counties and the second-largest of 62 counties in New York State, Suffolk measures 86 miles (138 km) in length and 26 miles (42 km) in width at its widest (including water). Major scientific research facilities in Suffolk County include Brookhaven National Laboratory in Upton, Cold Spring Harbor Laboratory in Huntington, and Plum Island Animal Disease Center on Plum Island. Suffolk County was part of the Connecticut Colony before becoming an original county of the Province of New York, one of twelve created in 1683. From 1664 until 1683 it had been the East Riding of Yorkshire. Its boundaries were essentially the same as at present, with only minor changes in the boundary with its western neighbor, which was originally Queens County but has been Nassau County since the separation of Nassau from Queens in 1899. According to the Suffolk County website, the county is the leading agricultural county in the state of New York, saying that: "The weather is temperate, clean water is abundant, and the soil is so good that Suffolk is the leading agricultural county in New York State. That Suffolk is still number one in farming, even with the development that has taken place, is a tribute to thoughtful planning, along with the excellent soil, favorable weather conditions, and the work of dedicated farmers in this region." According to the U.S. Census Bureau, the county has an area of 2,373 square miles (6,150 km2), of which 912 square miles (2,360 km2) is land and 1,461 square miles (3,780 km2) (62%) is water. It is the second-largest county in New York by total area and occupies 66% of the land area of Long Island. Suffolk County occupies the central and eastern part of Long Island, in the extreme east of New York State. The eastern end of the county splits into two peninsulas, known as the North Fork and the South Fork. The county is surrounded by water on three sides, including the Atlantic Ocean and Long Island Sound, with 980 miles (1,580 km) of coastline. The eastern end contains large bays. The highest elevation in the county, and on Long Island as a whole, is Jayne's Hill in West Hills, at 401 feet (122 m) above sea level. As of the census of 2010, there were 1,493,350 people and 569,985 households residing in the county. The population of Suffolk County was estimated by the U.S. Census to have decreased slightly to 1,492,953 in 2017, representing 7.5% of the Census-estimated New York State population of 19,849,399 and 19.0% of the Census-estimated Long Island population of 7,869,820. The population density in 2010 was 1,637 people per square mile (633/km²), with 569,985 households at an average density of 625 per square mile (242/km²). However, by 2012, with an estimated total population increasing moderately to 1,499,273 there were 569,359 housing units. By 2014, the racial makeup of the county was estimated at 85.2% White of any ancestry including Hispanic, 8.3% African American, 0.6% Native American, 4.0% Asian, 0.1% Pacific Islander, 1.8% from two or more races . Hispanic or Latino of any race were 18.2% of the population. Those who identified as "white alone", not being of Hispanic or Latino origin, represented 69.3% of the population. In 2006, the racial or ethnic makeup of the county was 83.6% White (75.4% White Non-Hispanic). African Americans were 7.4% of the population. Asians stood at 3.4% of the population. 5.4% were of other or mixed race. Latinos were 13.0% of the population. The most common ethnicities in Suffolk County in 2007 were Italian (29.5%), Irish (24.0%), and German (17.6%). In 2002, The New York Times cited a study by the non-profit group ERASE Racism, which determined Suffolk and its neighboring county, Nassau, to be the most racially segregated suburbs in the United States. In 2006, there were 469,299 households, out of which 37.00% had children under the age of 18 living with them, 62.00% were married couples living together, 10.80% had a female householder with no husband present, and 23.20% were non-families. 18.30% of all households were made up of individuals and 7.80% had someone living alone who was 65 years of age or older. The average household size was 2.96 and the average family size was 3.36. In the county, the population was spread out with 26.10% under the age of 18, 7.60% from 18 to 24, 31.20% from 25 to 44, 23.30% from 45 to 64, and 11.80% who were 65 years of age or older.[when?] The median age was 36 years. For every 100 females, there were 95.90 males. For every 100 females age 18 and over, there were 92.80 males. In 2008, Forbes magazine released its American Community Survey and named Suffolk County number 4 in its list of the top 25 richest counties in America. In 2016, according to Business Insider, the 11962 zip code encompassing Sagaponack, within Southampton, was listed as the most expensive in the U.S., with a median home sale price of $8.5 million. The median income for a household in the county was $84,767, and the median income for a family was $72,112. Males had a median income of $50,046 versus $33,281 for females. The per capita income for the county was $26,577. Using a weighted average from 2009-2014 about 6.40% of the population were below the poverty line In earlier censuses, the population below the poverty line included 2.70% of those under age 18 and 2.30% of those age 65 or over. As of 2006, Suffolk County ranked at number 21 on the list of the most populous counties in the United States. American Indian, Native Alaskan, Native Hawaiian, and Pacific Islander make up just 0.5% of the population of Long Island, and have been included with "Other". Suffolk County had long been a Republican bastion in New York State. U.S. Congressman Rick Lazio, who opposed Hillary Clinton in the 2000 Senate race, was from Suffolk County. However, recent elections have turned the county more toward the Democrats. In 2003, Democrat Steve Levy was elected county executive, ending longtime Republican control. In 2001, Democrat Thomas Spota was elected District Attorney, and ran unopposed in 2005. Although Suffolk voters gave George H. W. Bush a victory here in 1992, the county voted for Bill Clinton in 1996 and continued the trend by giving Al Gore an 11-percent victory in the county in 2000. 2004 Democratic candidate John Kerry won by a much smaller margin of one percent, in 2008 Democratic candidate Barack Obama won by a slightly larger 4.4 percent margin, 52%-47%. In 2016, Republican candidate Donald Trump won Suffolk County by a 6.9 percent margin after absentees, marking the largest margin of victory for the Republicans since 1988. It was the only large county (over 200,000 voters) in New York State that Donald Trump won. Suffolk County is represented by three New York congressional districts: the first, and parts of the second and third. The third is held by the Democratic Party, while the first and second are held by Republicans. Lee Zeldin represents the first district, which includes almost half of the county, from Smithtown to Montauk, including The Hamptons and Riverhead. The second district is represented by Republican Peter King, and includes parts of southern Suffolk and Nassau counties. The third district is largely split between Nassau County and Suffolk County, and is represented by Tom Suozzi. A Democrat, Suozzi won the seat vacated by Steve Israel in 2016 after Israel declined to seek re-election. Map showing Long Island congressional districts 1, 2, and 3 after redistricting in 2012. Portions in red are within Suffolk County. As a whole both Suffolk and Nassau counties are considered swing counties. However, until 2016 they tended not to receive significant attention from presidential candidates, as the state of New York has turned reliably Democratic at the national level. In 2008 and 2012, Hofstra University in Nassau County hosted a Presidential debate. Hofstra hosted the first debate of the 2016 Presidential Election season, on September 26, 2016, making Hofstra the first college or university in the United States to host a Presidential debate in three consecutive elections. The presence on the 2016 ticket of Westchester County resident Hillary Clinton and Manhattan resident Donald Trump resulted in greater attention by the candidates to the concerns of Long Island. Trump visited Long Island voters and donors at least 4 times while Hillary made 1 stop for voters and 1 additional stop in the Hamptons for donors. County Clerk Judith A. Pascale Rep ? ** Levy was originally elected as a Democrat, but became a Republican in 2010. Republicans controlled the county legislature until a landmark election in November 2005 where three Republican seats switched to the Democrats, giving them control. In November 2007, the Democratic Party once again retained control over the Suffolk County Legislature, picking up one seat in the process. In November 2009, the Republican Party regained the seat lost in 2007 but still remained in the minority for the 2010-2011 session. In November 2011, the Democratic Party maintained control over the Suffolk County Legislature picking up one seat that had been held by an Independence Party member. In November 2013, the Republican Party gained the 14th district seat, but remains in the minority. As of the 2016-2017 session, 15th district legislator DuWayne Gregory serves as Presiding Officer, a position he has held since 2013, 7th district legislator Robert Calarco serves as Deputy Presiding Officer. 5th district legislator Kara Hahn serves as Majority Leader for the Democrats. 14th district legislator Keving McCaffrey is Minority Leader having assumed the office after the election of former legislator John M. Kennedy, Jr. to the office of County Comptroller. Police services in the five western towns (Babylon, Huntington, Islip, Smithtown and Brookhaven) are provided primarily by the Suffolk County Police Department. The five "East End" towns (Riverhead, Southold, Shelter Island, East Hampton, and Southampton), maintain their own police and other law enforcement agencies. Also, there are a number of villages, such as Amityville, Lloyd Harbor, Northport and Westhampton Beach, that maintain their own police forces. In an unusual move, the Village of Greenport in 1994 voted to abolish its police department and turn responsibility for law and order over to the Southold Town Police Department. After the Long Island State Parkway Police was disbanded in 1980, all state parkways in Suffolk County became the responsibility of Troop L of the New York State Police, headquartered at Republic Airport. State parks, such as Robert Moses State Park, are the responsibility of the New York State Park Police, based at Belmont Lake State Park. In 1996, the Long Island Rail Road Police Department was consolidated into the Metropolitan Transportation Authority Police, which has jurisdiction over all rail lines in the county. Since the New York state legislature created the New York State University Police in 1999, they are in charge of all law enforcement services for State University of New York property and campuses. The State University Police have jurisdiction in Suffolk County at Stony Brook University and Farmingdale State College. The Suffolk County Sheriff's Office is a separate agency. The sheriff, an elected official who serves a four-year term, operates the two Suffolk County correctional facilities (in Yaphank and Riverhead), provides county courthouse security and detention, service and enforcement of civil papers, evictions and warrants. The Sheriff's Office is also responsible for securing all county-owned property, such as county government office buildings, as well as the campuses of the Suffolk County Community College. As of 2008, the Suffolk County Sheriff's Office employs 275 Deputy Sheriffs, 850 Correction Officers and about 200 civilian staff. 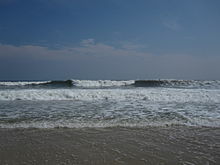 Suffolk County has a long maritime history with several outer barrier beaches and hundreds of square miles of waterways. The Suffolk Police Marine Bureau patrols the 500 square miles (1,000 km2) of navigable waterways within the police district, from the Connecticut and Rhode Island state line which bisects Long Island Sound - , to the New York state line 3 miles (5 km) south of Fire Island in the Atlantic Ocean. Some Suffolk County towns (Islip, Brookhaven, Southampton, East Hampton, Babylon, Huntington, Smithtown) also employ various bay constables and other local marine patrol, which are sworn armed peace officers with full arrest powers, providing back up to the Suffolk Police Marine Bureau as well as the United States Coast Guard. This includes Fire Island and even parts of Jones Island barrier beaches and the islands of the Great South Bay. Marine units also respond to water and ice rescues on the inland lakes, ponds and streams of the District. Suffolk County is part of the 10th Judicial District of the New York State Unified Court System; is home to the Alfonse M. D'Amato Courthouse of the Federal U.S. District Court, Eastern District of New York; and has various local municipal courts. The State Courts are divided into Supreme Court, which has general jurisdiction over all cases, and lower courts that either hear claims of a limited dollar amount, or of a specific nature. Similarly, the local courts hear claims of a limited dollar amount, or hear specific types of cases. The Federal Court has jurisdiction over Federal Claims, State Law claims that are joined with Federal claims, and claims where there is a diversity of citizenship. The Suffolk County Supreme Court is a trial court of unlimited general original jurisdiction, but it generally only hears cases that are outside the subject-matter jurisdiction of other trial courts of more limited jurisdiction. The Suffolk County Clerk is the Clerk of the Court of the Supreme Court. The main courthouse for the Supreme Court is in Riverhead, which has been the court's home since 1729. The original courthouse was replaced in 1855, and that courthouse was expanded in 1881. The courthouse was damaged by fire and rebuilt in 1929. In 1994, a new court building was added to the complex. This Courthouse was dedicated as the "Alan D. Oshrin Supreme Court Building" on August 1, 2011. The Supreme Court also shares space in the Cohalan Court Complex in Central Islip with several other courts and county agencies. Matrimonial actions are heard in the Supreme Court, and those matters are generally heard in the Supreme Court section of the Cohalan Court Complex. The Suffolk County Court is a trial court of limited jurisdiction. It has jurisdiction over all of Suffolk County, and is authorized to handle criminal prosecutions of both felonies and lesser offenses committed within the county, although in practice most minor offenses are handled by the local courts. It is the trial court for felonies, or where a person is indicted by a Grand Jury in Suffolk County. The County Court also has limited jurisdiction in civil cases, generally involving amounts up to $25,000. The County Court is in the Cromarty Court Complex Criminal Courts Building in Riverhead. The Suffolk County Surrogate's Court hears cases involving the affairs of decedents, including the probate of wills and the administration of estates, guardianships, and adoptions. The Surrogate's Court is in the County Center in Riverhead. The Suffolk County Family Court has jurisdiction over all of Suffolk County in petitions filed for Neglect & Abuse, Juvenile Delinquency/Designated Felonies, Persons in Need of Supervision, Adoption, Guardianship, Foster Care, Family Offense (Order of Protection), Custody & Visitation, Paternity, Support Matters (Child & Spousal), Consent to Marry. The court also has a Juvenile Drug Court and Family Treatment Court. Individuals, attorneys, and agencies may initiate a proceeding in the Family Court with the filing of a petition. The Suffolk County Family Court is in the Cohalan Court Complex in Central Islip and maintains a facility in Riverhead. Case assignment is dependent upon the geographical location of the parties. The District Court and the Town and Village Courts are the local courts of Suffolk County. There are more than 30 local courts, each with limited criminal and civil subject matter and geographic jurisdictions. The local criminal courts have trial jurisdiction over misdemeanors, violations and infractions; preliminary jurisdiction over felonies; and traffic tickets charging a crime. The local civil courts calendar small claims, evictions, and civil actions. Suffolk County District Court has geographic jurisdiction over the 5 western towns of Suffolk County (Babylon, Brookhaven, Huntington, Islip & Smithtown). The Criminal division of the Suffolk District Court is in the Cohalan Court Complex, Central Islip, and includes Domestic Violence Courts, Drug Court, and a Mental Health Court. The Civil division is divided up in the 5 "outlying" courthouses in Lindenhurst, Huntington Station, Hauppauge, Ronkonkoma, and Patchogue. Civil actions may be filed up to $15,000, and small claims actions up to $5000. Actions are commenced by filing with the court. Summary proceedings under the RPAPL are filed in the district where the property is located. The Town Courts of East Hampton, Riverhead, Shelter Island, Southampton, and Southold have geographic jurisdiction over the 5 eastern towns of Suffolk County. Each town maintains a courthouse where judges hear criminal cases (including a regional Drug Court) and civil actions. Civil actions are commenced by serving a summons and complaint for claims up to $3,000, and small claims actions are heard up to $3000. Summary proceedings under the RPAPL are filed in the town where the property is located. 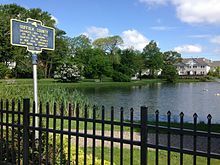 The Village Courts of Amityville, Asharoken, Babylon, Belle Terre, Bellport, Brightwaters, Head of the Harbor, Huntington Bay, Islandia, Lake Grove, Lindenhurst, Lloyd Harbor, Nissequogue, Northport, Ocean Beach, Old Field, Patchogue, Poquott, Port Jefferson, Quogue, Sag Harbor, Saltaire, Shoreham, Southampton, Village of the Branch, West Hampton Dunes, and Westhampton Beach have geographic jurisdiction within each incorporated village. Criminal and civil subject matter jurisdiction varies in each court. Most non-criminal moving violation tickets issued in the 5 west towns are handled by the Traffic Violations Bureau, which is part of the New York State Department of Motor Vehicles, not the court system. Suffolk County Community College campuses in Riverhead, Selden, and Brentwood, with satellite centers in Sayville and downtown Riverhead. I-495 (Long Island Expressway) traverses the county from the Nassau County line in the West to Riverhead in the East. Original plans called for the Expressway to extend further past Riverhead and along the island's North Fork, possibly to Orient Point, where a crossing to Connecticut could be built. The expressway connects to Manhattan via the Queens-Midtown Tunnel. New York State Route 27 crosses the county from the Nassau County line in the West to Montauk Point in the East, which is also the easternmost point in New York State. The road is limited-access from West Babylon to Southampton. Several airports serve commuters and business travelers, most notably Long Island MacArthur Airport in Ronkonkoma, Republic Airport in East Farmingdale and Francis S. Gabreski Airport in Westhampton Beach. Suffolk County is served by Suffolk County Transit. Long Island Rail Road, the Hampton Jitney, and Hampton Luxury Liner connect Suffolk County to New York City. Fire Island Lighthouse was an important landmark for many trans-atlantic ships coming into New York Harbor in the early 20th century. For many European immigrants, the Fire Island Light was their first sight of land upon arrival in America. The Fire Island Inlet span of the Robert Moses Causeway connects to Robert Moses State Park on the western tip of Fire Island. The Great South Bay Bridge, the first causeway bridge, had only one northbound and one southbound lane, was opened to traffic in April 1954. The span of 2 miles (3 km) across Great South Bay to Captree Island features a main span of 600 feet (200 m), with a clearance for boats of 60 feet (20 m). After crossing the State Boat Channel over Its 665-foot (203 m)-long bascule bridge, the causeway meets the Ocean Parkway at a cloverleaf interchange. This interchange provides access to Captree State Park, Gilgo State Park and Jones Beach State Park. The Fire Island Inlet Bridge continues the two-lane road, one lane in each direction, across Fire Island Inlet to its terminus at Robert Moses State Park and The Fire Island Lighthouse. Robert Moses Causeway opened in 1964. Suffolk County has the most lighthouses of any other United States county, with fifteen of its original twenty-six lighthouses still standing. Of these fifteen, eight are in Southold township alone, giving it more lighthouses than any other township in the United States. At various times, there have been proposals for a division of Suffolk County into two counties. The western portion would be called Suffolk County, while the eastern portion of the current Suffolk County would comprise a new county to be called Peconic County. Peconic County would consist of the five easternmost towns of Suffolk County: East Hampton, Riverhead, Shelter Island, Southampton and Southold, plus the Shinnecock Indian Reservation. The proposed Peconic County flag showed the two forks at the east end of Long Island separated by Peconic Bay. The star on the north represents Southold. The stars on the South Fork represent Southampton and East Hampton. Riverhead is at the fork mouth and Shelter Island is between the forks. The secessionist movement has not been active since 1998. The End of the Hamptons: Scenes from the Class Struggle in America's Paradise, by Corey Dolgon (New York University Press, 2005) examined the class roots of the secessionist movement in the Hamptons. In his review, Howard Zinn wrote that the book "[t]akes us beyond the much-romanticized beaches of Long Island to the rich entrepreneurs and their McMansions, the Latino workers, and the stubborn indigenous residents refusing to disappear. The book is important because it is in so many ways a microcosm of the nation." The book won the Association for Humanist Sociology's 2005 Book Prize and the American Sociological Association's Marxist Section Book Award in 2007. 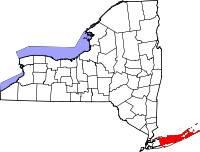 In New York State, a town is the major subdivision of each county. Towns provide or arrange for most municipal services for residents of hamlets and selected services for residents of villages. All residents of New York who do not live in a city or on an Indian reservation live in a town. A village is an incorporated area which is usually, but not always, within a single town. A village is a clearly defined municipality that provides the services closest to the residents, such as garbage collection, street and highway maintenance, street lighting and building codes. Some villages provide their own police and other optional services. A hamlet is an informally-defined populated area within a town that is not part of a village. Gardiners Island is an island off eastern Suffolk County in the U.S. state of New York. The Island is 6 miles (10 km) long, and 3 miles (5 km) wide and has 27 miles (43 km) of coastline. The same family has owned the Island for nearly 400 years, one of the largest privately owned islands in America or the world. It is, however, the only American real estate still intact as part of an original royal grant from the English Crown. Robins Island is an Island in the Peconic Bay between the North and South folks of eastern Suffolk County. It is within the jurisdiction of Town of Southold in Suffolk County, New York. The Island is 435 acres (1.8 km2) and presently undeveloped. The island is privately owned and not accessible to the public. ^ a b "State & County QuickFacts - Suffolk County, New York". United States Census Bureau. Retrieved March 30, 2018. ^ "Suffolk County Government". Suffolk County, New York. Retrieved April 22, 2015. ^ http://www.co.suffolk.ny.us/ "About Suffolk County"
^ "2010 Census Gazetteer Files". United States Census Bureau. August 22, 2012. Archived from the original on May 19, 2014. Retrieved January 7, 2015. ^ "U.S. Decennial Census". United States Census Bureau. Retrieved January 7, 2015. ^ "Historical Census Browser". University of Virginia Library. Retrieved January 7, 2015. ^ "Population of Counties by Decennial Census: 1900 to 1990". United States Census Bureau. Retrieved January 7, 2015. ^ "Census 2000 PHC-T-4. Ranking Tables for Counties: 1990 and 2000" (PDF). United States Census Bureau. Retrieved January 7, 2015. ^  Accessed March 30, 2018. ^ Lambert, Bruce (June 5, 2002). "Study Calls L.I. Most Segregated Suburb". The New York Times. Retrieved May 11, 2010. ^ Raisa Bruner (March 7, 2016). "The 25 most expensive ZIP codes in America". Business Insider. Retrieved March 9, 2016. ^ "2010 Census brief" (PDF). ^ "The Association of Religion Data Archives (ARDA), Year 2000 Report". Churches were asked for their membership numbers. ARDA estimates that most of the churches not reporting were black Protestant congregations. ^ "The Association of Religion Data Archives (ARDA), Year 2000 Report". ^ a b Leip, David. "Dave Leip's Atlas of U.S. Presidential Elections". uselectionatlas.org. Retrieved 2018-10-25. ^ " "Archived copy". Archived from the original on September 27, 2011. Retrieved August 22, 2011. CS1 maint: Archived copy as title (link)". ^ "10th Judicial District: Suffolk County". ^ "Structure & Jurisdiction of the Courts". ^ "Federal jurisdiction (United States)". ^ "The Suffolk County Supreme Court". ^ a b "Directions to the Suffolk County Courts"
Wikivoyage has a travel guide for Suffolk County.